You can enter items the business purchases. You can identify their inventory category, who supplies the item and the suppliers contact information. 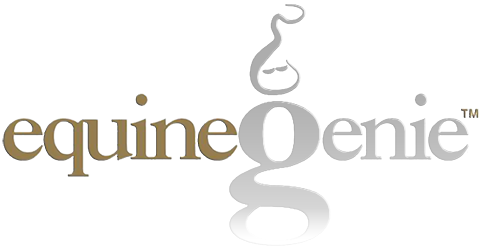 You can add the supplier to the equineGenie address book. equineGenie allows an item to have more than one supplier. In fact this is recommended for supplies that are critical to your business. You can specify an items safety stock, the item’s unit of measure and the item’s delivery lead time. equineGenie uses this information and an item’s consumption rate to remind you when to reorder. You can purchase items in equineGenie. To purchase an item you select the item, enter the item’s purchase and delivery date, enter the items quantity, tell equineGenie how soon it will be used and how much it cost. It is as simple as 1,2,3. If a purchased item has an expiration date, enter the item's expiration date and equineGenie will track the item and alert you if it has expired. You can scan and save your purchase receipts in equineGenie. You can take an inventory by item, item location and item count by location. equineGenie calculates and displays any changes in an item’s inventory (srunkage and overage). Inventory reports for the last business inventory, last business inventory by location and an item’s amount on hand as of the current date can be viewed, exported and/or printed. Items used in a horse’s nutrition program are automatically totaled for all horses daily and deducted from inventory. Feed reorder reminders are automatically generated based on a feeds consumption rate, safety stock and supplier delivery lead time. Items that are inventoried, but do not have a scheduled use can be deducted from inventory using the Supplies Used screen. Equipment and Vehicle management with maintenance schedules with reminders, mileage tracking and management, vehicle department allocation, vehicle insurance management with renewal reminders, transportation services management with calculated cost. Trip logs with purpose and mileage, scheduled maintenance managed and reported, repairs managed and reported, fuel use managed, mileage calculated and reported. You can add an unlimited number of vehicles into equinegenie. You can specify a vehicles use and it hire rate if you use it to service customers. You can enter a mileage expense rate per mile if the vehicle is not depreciated. You can allocate a vehicles use to multiple departments. You can schedule a vehicles periodic maintenance such as oil changes, brake checks, wheel bearing packs or scheduled services. equineGenie will generate a reminder when the service is due. You can track and manage a vehicles insurance. equineGenie will generate a reminder when the insurance renewal is due. If the vehicle is used for hire equineGenie will track its use and mileage. equineGenie tracks, manages, accounts for and reports a vehicle’s maintenance and repairs. You can enter a vehicle’s destination and purpose when it is used. equineGenie will track and manage its use, and generate a trip log. When fuel is purchased for a vehicle it can be entered into equineGenie. equineGenie will calculate a vehicle’s cost per mile or kilometer. The cost included a vehicle’s maintenance and repair expense, fuel cost and depreciation if the vehicle is a depreciated asset. Employee information, work schedules, employee status and compensation, department allocation, insurance management with renewal reminders, assignment management with compensation calculations. business expense tracked, managed and reported. You can enter an employee’s contact information, work hours, pay, supervisor, job title, holidays and vacation. An employee’s picture can be added. A worker can be designated a contractor. If they are designated a contract equineGenie will track their pay and provide their tax filing (1099) information if their pay is equal to or exceeds a countries designated limit. An employee or contractor can be allocated to multiple departments on a percentage basis. An employee or contractors job assignments can be tracked , measured and reported (time clock). An employee’s insurance can be tracked, managed and reported. equineGenie will generate a renewal notice. equineGenie provides an expense report that can record employee and or contractor business expenses.